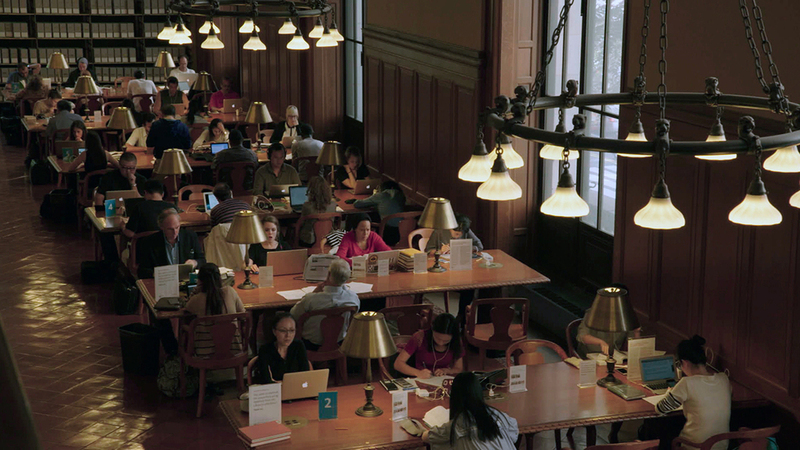 Frederick Wiseman, Ex Libris: New York Public Library, 2017, HD video, color, sound, 197 minutes. ONE OF THE MYSTERIES OF Ex Libris: New York Public Library is how a movie consisting almost entirely of people sitting around talking on library grounds manages to feel urgent and invigorating. Ex Libris doesn’t skate. The film was shot in and around properties belonging to the New York Public Library system, which services Manhattan, the Bronx, and Staten Island. While returning most frequently to the Beaux arts main branch on Bryant Park, he also circulates through the Performing Arts Library at Lincoln Center, a Chinatown branch, and the Schomburg Center for Research in Black Culture in Harlem, and goes as far afield as Kingsbridge Road in the Bronx. Some of the subjects are celebrities speaking at public events: Richard Dawkins, Elvis Costello, and Ta-Nehisi Coates. Many others are not: patrons at various library functions or rank-and-file staffers giving tours of their individual domains (resources such as the century-old picture collection or the archival print collection). Ex Libris was shot in fall 2015, its editing completed during a period of political lunacy. This is felt in the final product, as when Costello describes his song “Tramp the Dirt Down” as a response to Margaret Thatcher and “what she let loose in the country,” summarized as “the desire to stamp on your fellow countryman.” What his film offers, by contrast, is a vision of extraordinary warmth and fellow feeling, deeply respectful of the intelligence that it allows its dozens of subjects the opportunity to display. (The lone exception is a US Border Patrol agent seen speaking haltingly at a job fair in the Bronx.) In Wiseman’s latest there is a quiet kind of wonderment—at the variety of modes of human expression, at the volume of the records of that expression. Wiseman has never shied away from critiquing the institutions that he puts under the scrutiny of his deadpan, observational lens, but this is counterbalanced by his clear belief in the potential of the individual—in the course of presenting things as they are, he offers a sense of things as they might be. The glimmers of Utopia in Ex Libris make the present beleaguered state of the republic keenly felt, but to harp on the movie’s “new, sad relevance in the Age of Trump,” however, would be to ignore the degree to which Wiseman positions the NYPL facilities not only as repositories of world culture but as stages for the continuation of a floating conversation on the promises and pitfalls of American civilization that has been ongoing since 1776. Among the film’s many accomplishments is its ability to reveal the vitality of dusty documents, be it Albrecht Dürer’s woodcut print of a rhinoceros; Love in the Time of Cholera, discussed by a senior reading group through the filter of life experience; or foundational texts of American civic thought. The scene in which a sign-language interpreter for theatrical productions demonstrates her craft by signing two differently pitched readings of the preamble to the US Declaration of Independence is perhaps the most moving screen staging of an American political document since Charles Laughton read the Gettysburg Address in Leo McCarey’s Ruggles of Red Gap (1935). The sense of the imperative in Lincoln’s statement runs throughout Ex Libris. As Wiseman suggests, the library is an essential bulwark in that mission to maintain and perfect a free society. 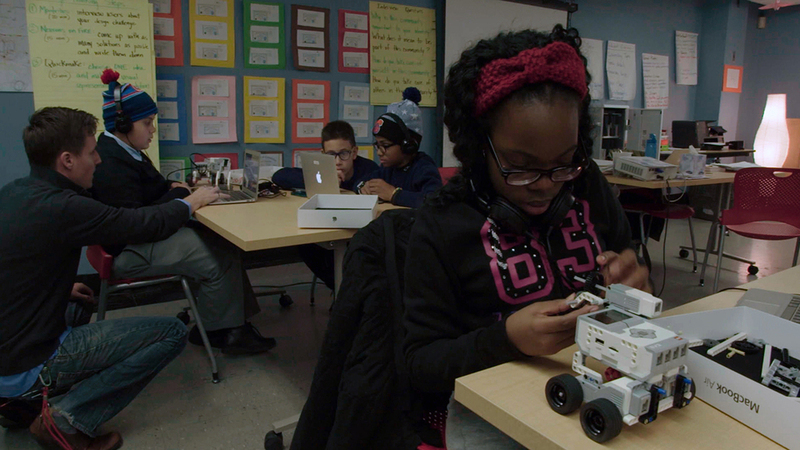 The film is a celebration of every variety of learning, from the pedagogical to the pleasure of solitary reading. In one lovely scene, we see the recording of an audiobook of Vladimir Nabokov’s Laughter in the Dark, in which Wiseman briefly cuts away from the voice actor to the sound editor, catching her just as the color of the light reflecting on her face from her desktop computer changes—a literal vision of illumination. Wiseman’s self-appointed mission to parse the fine print of society has always seemed to me a heroic act, insofar as art can be described as “heroic.” The idea that the world has reached its present state due to the machinations of conspiratorial shadow governments has gained a great deal of traction among Americans of all political inclinations. I have always thought it likely that the truth was more mundane and sadder—that all the information is in plain sight, but that very few want to be bothered with it. Wiseman’s films take on that trouble, and in doing so provide a reminder to vigilance. The least of them are always of interest, and the greatest—in which company Ex Libris belongs—are nothing short of emancipatory. Ex Libris: New York Public Library runs Wednesday, September 13, through Tuesday, September 26, at Film Forum in New York.